You've been playing with Tableau and its sample data sets, but now you're ready to find some data that's a little more fun. Where do you start? There are countless sources of data you can bring in to Tableau - some easily, and others that require data cleaning and shaping. In this post we'll highlight a few favorites, but we'll provide a more extensive list for you to explore too. If you're looking for links to data sources or data cleaning, skip down to the bottom of the post. This might be obvious, but in addition to the sample data sets, did you know you can download Tableau workbooks directly and get started vizzing with Tableau-ready data? It's true. Spend time looking through vizzes by our incredible Featured Authors or in our Viz of the Day and Greatest Hits galleries. While you're getting inspired, scroll to the bottom of the viz in the viz toolbar and click Download. If Tableau Workbook is available, then you can open the workbook directly and start vizzing! Don't worry, you won't change anything about the original viz - this is now your copy to use as a learning tool. One tip: if you download someone else's work in order to learn, don't forget to include an attribution somewhere on the viz so credit goes where credit's due! 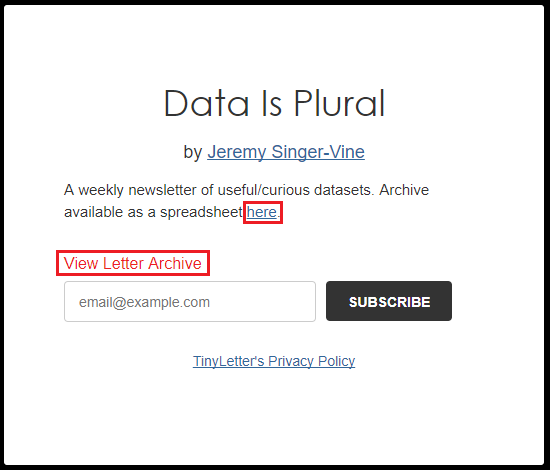 Jeremy Singer-Vine's weekly tiny letter has been a treasure trove of cool data since 2015. Sign up and you'll get data delivered to your inbox, forcing you to choose each week which data set will finally get your attention. I've seen data about refugee routes, retiree language preferences (courtesy of the Social Security administration! ), linguistics, movie ratings...more data than I could viz in a lifetime. 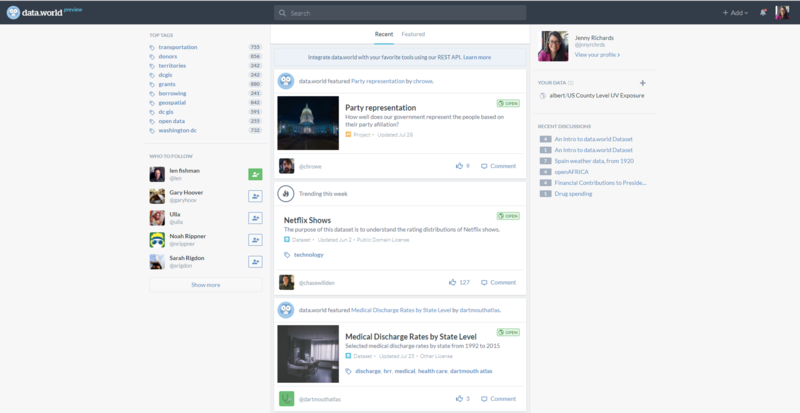 data.world is a social data platform where users upload data sets to encourage collaboration. Members of data.world's community improves the data through the addition of supplemental content, data cleaning, or by adding visualizations. It's rich with diverse data sets and users, and an excellent platform for collaborative analysis. 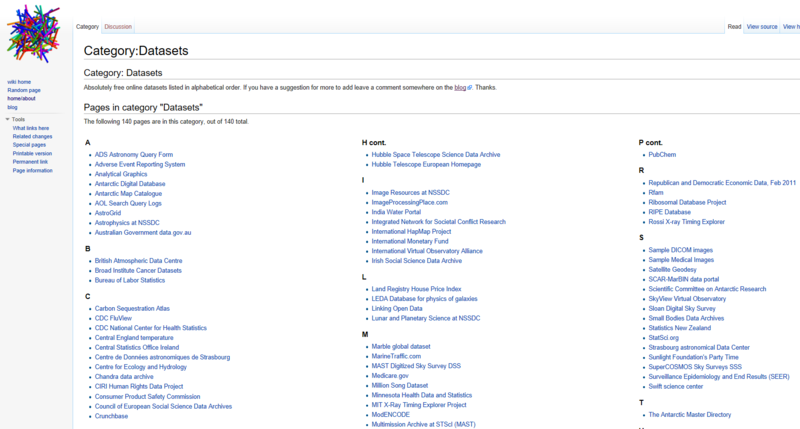 This data wiki and accompanying blog is a passion project from researcher Lyndie Chiou, and is a bonanza of science data. Science has its own vocabulary and each subject its own tools, so be warned: data cleaning will be required. But any list that includes data for the wooly mammoth genome on the same page as the Hubble data archive is worth a second look. Still haven't seen a data source that inspires you? Check out our recent webinar, 10 Data sources you can use in class, or download our list of 30 data sources, complete with descriptions of the sites, the formats of data, and any gotchas you might encounter. You say you already have a data set, but you need help cleaning it? Look no further. Here are some resources to get you started. What are your go-to data sources? Share them with the community via Twitter or Facebook and get vizzin!